Author contributions: Mastroianni CM, Lichtner M, Citton R, Del Borgo C, Rago A and Martini H contributed to manuscript conception, preparation and writing; Cimino G and Vullo V reviewed the manuscript. Hepatitis B virus (HBV) reactivation represents an emerging cause of liver disease in patients undergoing treatment with biologic agents. In particular, the risk of HBV reactivation is heightened by the use monoclonal antibodies, such as rituximab (anti-CD20) and alemtuzumab (anti-CD52) that cause profound and long-lasting immunosuppression. Emerging data indicate that HBV reactivation could also develop following the use of other biologic agents, such as tumor necrosis factor (TNF)-α inhibitors. When HBV reactivation is diagnosed, it is mandatory to suspend biologic treatment and start antiviral agents immediately. However, pre-emptive antiviral therapy prior to monoclonal antibody administration is crucial in preventing HBV reactivation and its clinical consequences. Several lines of evidence have shown that risk of HBV reactivation is greatly reduced by the identification of high-risk patients and the use of prophylactic antiviral therapy. In this article, we discuss current trends in the management of HBV reactivation in immunosuppressed patients receiving biologic therapy, such as rituximab, alemtuzumab and TNF-α antagonists. Hepatitis B virus (HBV) infection remains a major public health issue, and represents an important cause of liver-related morbidity and mortality. It is estimated that one third of the world’s population has been infected with HBV and 350 million people worldwide are affected by chronic HBV infection. HBV reactivation is a well-known phenomenon in chronic HBV carriers and it represents a life-threatening complication following cytotoxic or other immunosuppressive anticancer therapy[1-3]. The liver damage due to HBV reactivation is characterized by two pathogenetic phases. Initially, during the stage of intense immunosuppressive therapy, there is markedly enhanced viral replication, as reflected by increases in serum levels of HBV DNA, which results in widespread infection of hepatocytes. Following completion of immunosuppressive therapy and subsequent restoration of immune function, there is a rapid cytotoxic-T-cell-mediated destruction of HBV-infected hepatocytes, which is clinically characterized by development of hepatitis, hepatic failure, and even death. The risk of clinical manifestations is mainly seen in overt carriers of HBV, but hepatitis might be observed also in subjects with occult HBV infection, who are positive for markers of previous exposure to the virus. The most commonly reported types of chemotherapy related to HBV reactivation are those used for the treatment of hematological malignancy, especially malignant lymphoma[4,5]. Recently, the risk of HBV reactivation has been heightened by the use of biologic therapy, such as rituximab (anti-CD20) and alemtuzumab (anti-CD52) that cause profound and long-lasting immunosuppression. Emerging data indicate that HBV reactivation could also develop following the use of other monoclonal therapies, such as tumor necrosis factor (TNF)-α inhibitors[7,8]. 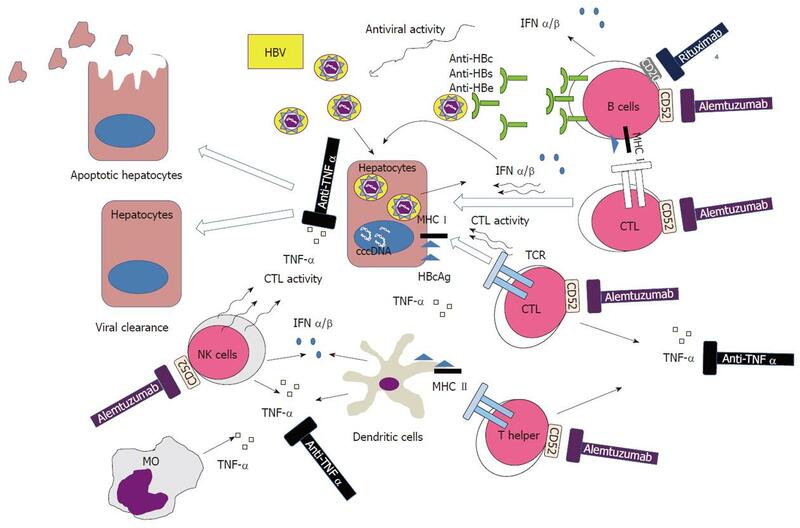 In the present article, we discuss the current trends for the management of HBV reactivation in immunosuppressed patients receiving biologic therapy, such as rituximab, alemtuzumab and TNF-α blockers. HBV reactivation is usually defined as an increase in HBV viral replication in patients with chronic or past HBV infection. The chance of HBV reactivation is closely linked to the serological profile of the infected patient. The risk is highest in patients who are positive for HBV surface antigen (HbsAg) (the so-called overt carriers of HBV). Nevertheless, HBV reactivation can occur also in HBsAg-negative patients who have only markers of previous exposure to HBV [hepatitis B core antibody (HBcAb)-positive with or without hepatitis B surface antibody (HBsAb)] (the so-called occult carriers of HBV)[11,12]. In such patients, a low level of HBV replication persists in the liver and in peripheral blood mononuclear cells for several years. The timing of HBV reactivation in patients undergoing monoclonal antibody therapy is not uniform. In overt carriers with high HBV viral load, hepatitis may occur during immunosuppressive treatment. However, in most cases, reactivation occurs following the cessation of biological treatment. At present, the most reliable and easy test used in clinical practice to diagnose HBV reactivation is the demonstration of an increase in serum HBV DNA levels. Serological tests, such as serum IgM HBcAb, are not sufficiently specific to discriminate between acute HBV infection and reactivation in patients with chronic HBV infection. HBV reactivation may be symptomatic or asymptomatic. Hepatitis should be ascribed to HBV reactivation if it is preceded or accompanied by enhanced HBV viral replication (demonstrable increase in HBV DNA by at least 10-fold, or an absolute increase to > 108 IU/mL). The time interval between the peak of HBV DNA viral load and hepatitis onset is variable. Classical features of hepatitis, including fatigue, jaundice, ascites, hepatic encephalopathy and coagulopathy, may be present. Patients with pre-existing cirrhosis are more likely to develop liver failure. Although some subjects can recover spontaneously, the mortality of HBV reactivation is reported as 5%-40%. In recent years, the effective management of various hematological malignancies and immune-mediated inflammatory diseases has included the use of monoclonal antibody therapy. Rituximab (anti-CD20), alemtuzumab (anti-CD52) and TNF-α inhibitors represents a modern therapeutic approach that has greatly improved the prognosis and outcome of several malignant and non-malignant conditions. However, these biologic agents induce a profound immunosuppression and their use has been reported to be associated with development of severe infections, including HBV reactivation[13,14]. Rituximab therapy represents one of the most important advances in the treatment of lymphoprolipherative disorders in the past 30 years. Rituximab is the archetype of this new class of compounds that is being currently used for the treatment of CD20-positive B-cell lymphoma, chronic lymphocytic leukemia (CLL) and autoimmune conditions, such as immune thrombocytopenia and collagenopathy. It is a chimeric murine-derived monoclonal antibody that is engineered by grafting the variable regions that target the CD20 antigen from a murine anti-CD20 antibody into human constant regions. Binding of rituximab to B cells activates complement and promotes C3b deposition in close proximity to cell-bound rituximab. In addition to antibody dependent cellular cytotoxicity (ADCC) and complement-dependent cytotoxicity, rituximab also induces apoptosis through activation of caspase-3 and sensitizes cells to pro-apoptotic stimuli, which appears to be crucial in rituximab-induced cell killing. Treatment with rituximab is not commonly associated with severe opportunistic infections, while the risk of HBV reactivation is significantly higher if compared to conventional chemotherapy. There are increasing reports of HBV reactivation after rituximab therapy, either when used alone or in combination with chemotherapy[3,16,17]. HBV infection has been reported to be the most common viral infection in patients affected by lymphoma and treated with rituximab. Aksoy et al have shown that rituximab-related HBV infections are associated with a mortality rate of 50% compared to 33% observed in patients with other infections. In a recent retrospective study, 80% of HBV carriers without lamivudine prophylaxis experienced HBV-related hepatitis, including one fatal hepatic failure. Moreover, about 4% of HBsAg-negative patients developed de novo HBV hepatitis and two died of fulminant hepatitis. The profound and durable depletion of circulating population of B cells induced by the drug lead to dysregulation in host immunity to HBV and represents the main pathogenetic factor involved in viral replication and reactivation. The control of HBV infection is mediated mainly by HBV-specific cytotoxic T lymphocytes; nevertheless, B lymphocytes are still essential for antigen presentation. The failure in antigen presentation related to the prolonged depletion of B cells by rituximab may allow the HBV to escape the cytotoxic T lymphocyte control, hence leading to development of viral hepatitis reactivation (Figure 1). Figure 1 Pathogenetic hypothesis of hepatitis B virus reactivation following monoclonal antibody treatment. IFN: Interferon; TNF: Tumor necrosis factor; MHC: Major histocompatibility complex; NK: Natural killer; MO: Monocytes; TCR: T-cell receptor; CTL: Cytotoxic T lymphocyte; HBV: Hepatitis B virus; HBcAg: HBV core antigen. Alemtuzumab is a humanized chimeric lymphocytotoxic monoclonal antibody that recognizes the antigen CD52, a 21- to 28-kDa heavily glycosylated membrane-anchored glycoprotein that is abundantly expressed on B and T cells, as well as on natural killer cells and macrophages). Typically, granulocytes, platelets, erythrocytes, and hematopoietic stem cells (HSCs) lack CD52 expression. CD52 is expressed on all CLL cells and indolent lymphomas. CD52 is not shed, internalized, or modulated and is therefore an ideal antigen for targeted immunotherapy. However, the ubiquitous expression of CD52 on lymphocytes and monocytes is predictive of the increased neutropenia, lymphopenia and infectious complications observed with alemtuzumab therapy. Alemtuzumab was first used in the allogeneic HSC transplantation as ex vivo treatment of donor HSC or in vivo as part of combination chemotherapy or for the conditioning regimen of patients undergoing HSC transplantation, with the aim to prevent graft-vs-host disease. More recently, alemtuzumab was approved for the treatment of high-risk patients with CLL. Most treated patients manifest profound peripheral-blood lymphopenia by 2-4 wk, which may persist for > 1 year. The effector mechanisms of alemtuzumab are not fully understood but may include ADCC, complement-mediated cell lysis, and induction of apoptosis (Figure 1). Alemtuzumab therapy is known to be associated with a high risk of serious bacterial, viral and fungal infections and should be used with great caution. The risk of severe infection, e.g., Pneumocystis jirovecy pneumonia, adenovirus infection and parvovirus B19 infection have also been reported. Although the risk of HBV reactivation after anti-CD52 monoclonal-antibody-mediated immunosuppression is not well defined, there have been multiple reports on the development of HBV reactivation after alemtuzumab therapy. In particular, alemtuzumab-containing chemotherapy regimens are associated with a high risk (29%) of reactivation of occult HBV infection and severe HBV-related hepatitis[14,21,22]. Considering the degree and duration of immunosuppression induced by alemtuzumab, chronic HBV-infected patients should be treated with pre-emptive anti-HBV therapy before commencement of an alemtuzumab-containing chemotherapy regimen. Emerging data suggest a potential risk of HBV reactivation in patients treated with anti-TNF-α agents. Currently, five TNF-α antagonists are approved in the United States for treatment of various immune-mediated inflammatory diseases, such as rheumatoid arthritis, psoriasis, psoriatic arthritis, ankylosing spondylitis, and Crohn’s disease. Four are antibodies directed against TNF-α: infliximab, a chimeric mouse/human monoclonal antibody; adalimumab and golimumab, humanized monoclonal antibodies; and certolizumab, a pegylated Fab fragment of humanized monoclonal antibody. The fifth drug, etanercept is a protein that blocks the TNF-α receptor on human cells. The critical role of TNF-α in mediating inflammation, particularly granulomatous inflammation, has led to an increased susceptibility to infections by intracellular pathogens, such as Mycobacterium tuberculosis, Mycobacterium avium complex, Histoplasma capsulatum, Cryptococcus neoformans, Coccidioides species, and possibly Pneumocystis, Listeria, and Aspergillus[23,24]. To date, no consensus exists about the safety of anti-TNF-α in patients with chronic HBV infection. The 2008 American College of Rheumatology recommendations contraindicate the use of anti-TNF-α in patients with hepatitis. A recent consensus statement on biologic agents for treatment of rheumatic diseases recommends that patients should be screened for HBV before anti-TNF-α initiation. Specific warnings about HBV reactivation have been added to the American label by the FDA, recommending that antiviral therapy should be used in patients in whom HBV infection is diagnosed during anti-TNF-α therapy. Various case reports have suggested that TNF-α inhibition facilitates HBV reactivation and replication, with fulminant hepatic failure or fatal outcomes. HBV reactivation resulting in acute or subfulminant hepatitis is more likely in active HBV carriers. The risk of viral reactivation in occult HBV carriers seems to be significantly lower, and it is seen especially in patients with intense immunosuppression. In a large study of 88 patients with potential occult HBV infections exposed to TNF-α blockers, a small number of cases of HBV reactivation was observed. It is currently unknown if the risk of HBV reactivation is homogeneous within the family of TNF-α inhibitors. Among different anti-TNF-α agents, infliximab seems to be more frequently associated with viral reactivation, although the reasons for this are still unclear. In chronic HBV infection, TNF-α has a dual role: it protects the hepatocytes by decreasing transcriptional activity of the HBV core promoter gene; and the cytokine can augment hepatocyte apoptosis and eventual liver fibrosis through different mechanisms. Thus, paradoxically, TNF-α blockade may be potentially beneficial, because long-term inhibition of this cytokine could have a protective effect on the hepatocytes; sparing them from injury and the liver from progressive fibrosis. However, failure to secrete appropriate amounts of TNF-α and impairment in the circulating CD8+ T-cell responses is associated with decreased clearance of HBV (Figure 1). This phenomenon raises concern regarding the safety of TNF-α inhibitors in patients with underlying liver disease. When HBV reactivation is diagnosed, it is mandatory to suspend all chemotherapy and start treatment with antiviral agents immediately. However, pre-emptive antiviral therapy prior to monoclonal antibody administration is crucial in preventing HBV reactivation and its clinical consequences. Several lines of evidence have shown that risk of HBV reactivation is greatly reduced by the identification of high-risk patients and the use of prophylactic antiviral therapy[9,29]. The early identification of patients at risk of HBV reactivation before they receive monoclonal antibody therapy is crucial for avoiding the serious morbidity associated with disease reactivation. Virological screening is recommended in all patients at risk of HBV reactivation, who are planned to receive monoclonal antibody therapy (Figure 2). Testing for HbsAg, HBcAb and HBsAb could allow identification of patients with chronic, occult or resolved infection. HBsAg-positive patients, including both the active carriers (detectable HBV DNA with the presence of liver damage) and the inactive carriers (undetectable HBV DNA with no liver damage), should be treated immediately, in order to block viral replication and disease progression before monoclonal antibody therapy is given. Figure 2 Proposed algorithm for the management of hepatitis B virus-infected patients requiring biologic therapy. HBV: Hepatitis B virus; TNF-α: Tumor necrosis factor α; HbsAg: HBV surface antigen; HBcAb: Hepatitis B core antibody; HBsAb: Hepatitis B surface antibody; ALT: Alanine transaminase; AST: Aspartate transaminase. Recommendations for standard management are less clear in patients with occult HBV infection (HBsAg-negative/HBcAb-positive with or without HBsAb and undetectable HBV DNA). Indeed, in these patients, the risk of disease reactivation is significantly lower if compared with HBsAg-positive individuals. 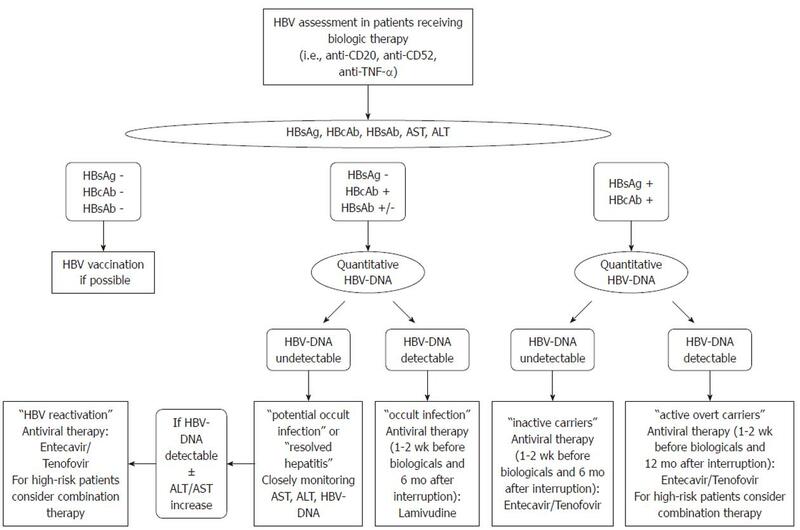 Therefore, it has been proposed that HBsAg-negative patients with positive HBcAb and undetectable HBV DNA should be strictly monitored by measurement of alanine aminotransferase (ALT) and serum HBV DNA; in case of HBV reactivation, as assessed by significant increase in HBV-DNA levels, they should be promptly treated with antiviral drugs, possibly before ALT elevation. Nevertheless, this approach is not universally accepted because a delay in the administration of antiviral treatment might expose the patient to the risk of severe hepatic failure during occult HBV infection. In our opinion, considering the relative safety of newer oral antiviral agents, prophylactic treatment represents a reasonable strategy; especially in high-risk patients receiving a rituximab-based regimen (Figure 2). The optimal timing and duration of antiviral prophylaxis should be individualized, taking into consideration viral and host factors. Starting antiviral treatment before immunosuppressive regimen and proceeding until the immune system has fully restored might be the most reasonable approach. In general, antiviral drugs should be initiated 1-2 wk before monoclonal antibody therapy and should be provided for at least 6 mo after the biologic treatment is stopped (Figure 2). Nevertheless, close monitoring of HBV DNA and ALT is strongly recommended after stopping prophylaxis to prevent severe HBV flare. Drugs used for treatment of HBV infection include interferon therapy and nucleos(t)ide analogs. Standard interferon (IFN)-α or pegIFN-α is contraindicated for treatment of HBV reactivation following biologic therapy. Currently, five oral nucleos(t)ide antiviral drugs are approved for the treatment of chronic HBV infection: lamivudine, adefovir, entecavir, tenofovir, and telbivudine. The most commonly used antiviral drug in HBV reactivation is lamivudine[31,32]. However, prognosis of patients undergoing a chemotherapeutic regimen including rituximab remains severe despite lamivudine therapy. Furthermore, lamivudine efficiency is hampered by the high rate of drug resistance mutations within HBV polymerase, which are associated with treatment failure. Lamivudine monotherapy can also select HBV strains associated with resistance to entecavir and adefovir. To date, current treatment guidelines no longer recommend lamivudine monotherapy as primary treatment for chronic hepatitis B. This drug may have still a role in the prevention of HBV reactivation in patients with occult HBV infection (Figure 2). Nevertheless, considering the high rate of mortality associated with HBV reactivation during monoclonal antibody therapy, the use of more potent and effective antiviral drugs needs to be evaluated. Adefovir has been used in patients with established HBV reactivation and individuals treated with lamivudine prophylaxis who have developed drug resistance. However, primary treatment failure occurs in ≥ 10% of patients treated with adefovir, and viral resistance occurs in nearly 30% of patients with hepatitis B e antigen-negative disease after 5 years of therapy. Entecavir and tenofovir are more potent and effective antiviral drugs that now represent the current preferred options for the management of treatment-naive patients with chronic HBV infection. These new-generation HBV polymerase inhibitors exhibit very low rates of resistance in nucleoside-naive patients when given as monotherapy. To date, there is no or very limited experience on the use of these drugs in the management of HBV reactivation in immunosuppressed patients undergoing monoclonal antibody therapy. There are a few case reports on telbivudine safety in HBV reactivation but there are no reports on tenofovir efficacy in HBV reactivation. The best evidence for antiviral prophylaxis of HBV reactivation is still for lamivudine (Figure 2), but there are few data on the use of entecavir. In two recent case reports, entecavir was successfully used as a first-line treatment for HBV reactivation following chemotherapy containing rituximab[38,39]. However, in another study, it has been shown that entecavir increases mortality of patients with HBV reactivation, by increasing lactic acidosis and encephalopathy. Recently, we described a case of HBV reactivation in a patient with non-Hodgkin’s lymphoma following a rituximab-based regimen: he was successfully treated with a combination antiviral treatment including entecavir and tenofovir. Antiviral treatment with entecavir was immediately initiated when the patient had HBV reactivation, and a rapid reduction of viral replication with normalization of transaminases was obtained. However, after a few months, the patient again presented with virological and biochemical breakthrough; probably related to the persistent and severe immune impairment of T- and B-cell function. We obtained full viral suppression and stable normalization of liver enzymes only after starting a combination strategy that included entecavir and tenofovir. Anti-HBV combination therapy has been considered in HBV-infected patients with decompensated cirrhosis and following liver transplantation. In our opinion, the combined use of antiviral drugs should be further evaluated for the management of HBV reactivation; especially in patients with severe impairment of the immune system (Figure 2), although safety data in different groups of patients are needed. HBV reactivation represents an important medical issue in HBV-infected patients receiving biological treatment with monoclonal antibodies, such as rituximab, alemtuzumab or TNF-α antagonists. The identification of high-risk patients with active, inactive and occult HBV infection and the use of prophylactic antiviral treatment is crucial in avoiding the serious morbidity associated with HBV disease reactivation. Finally, studies examining the safety and efficacy of the latest generation anti-HBV drugs in sequential monotherapy, or in combination, for the management of HBV reactivation should be strongly encouraged.